Marika and James Frost waited five years for a house to come up for sale on the street they now call home. They’d had their eye on a Victorian semi-detached house that they could modernise throughout, including a contemporary rear extension. Working with architect Allister Godfrey, they designed a spacious rear extension to become a new kitchen-diner and snug, while the old kitchen was split into a utility room, cloakroom and a playroom for the couple’s daughter Alina. As Marika is originally from Finland, she was keen to create a pared-back, practical scheme with wooden finishes, as well as a good link to the outdoors. Find our how they did it, then check out more real home transformations and find our more about extending a house in our guide. 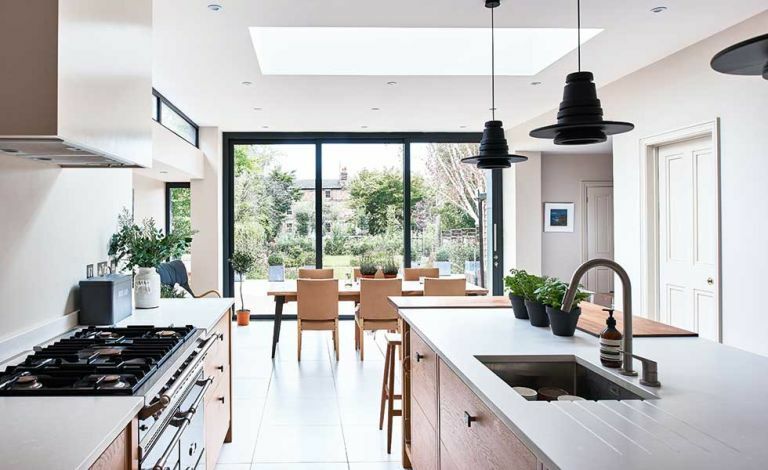 With a dated bay window extension built in the 1970s and an old Victorian lean-to traditionally used to house the WC, the house was in need of modernisation to create the open-plan kitchen-diner Marika and James wanted. In contrast to the classic-style front façade, the rear extension, clad in Prelaq Nova sheet, brings a new, modern look to the property. The bespoke kitchen, made by joiner Paul Yates, features tall painted tulipwood cabinetry and base cupboards and an island made from oak left unpainted to allow the beauty of the wood to become a focus.